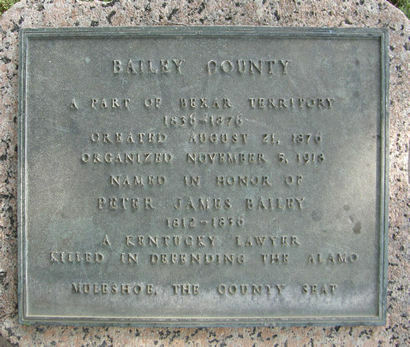 Bailey County was created August 21, 1876, and named for Peter James Bailey, a Kentucky lawyer killed at the Alamo during the Texas War for Independence. 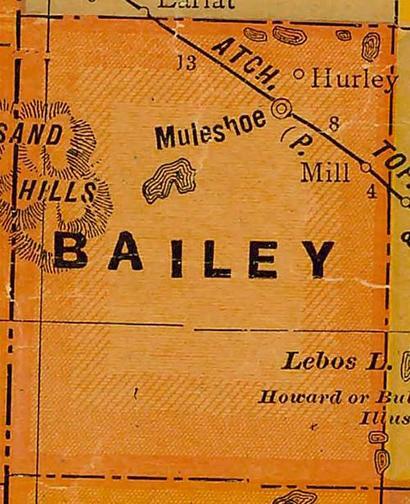 This was thinly settled cattle country; Bailey was attached for judicial purposes to Baylor County in 1876-1891, and to Castro County, 1892-1918. 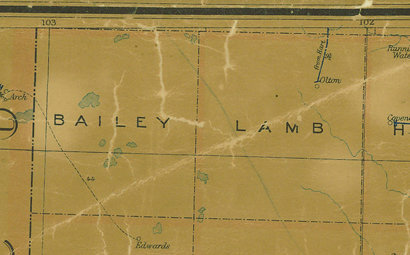 In November, 1918, Bailey County was finally organized. Its first officials were W. M. Wilterding, Judge; H. A. Douglass, Sheriff and Tax Assessor-Collector; C. C. Mardis, Clerk; G. P. Kuykendall, Treasurer; E. G. Hoskins, Inspector of Hides and Animals; J. B. Diggs, T. L. Snyder, C. E. Dotson and John S. McMurtry, Commissioners. At the first meeting of the commissioners court, in Blackwater Valley State Bank on January 16, 1919, C. D. Gupton was appointed Justice of the Peace. 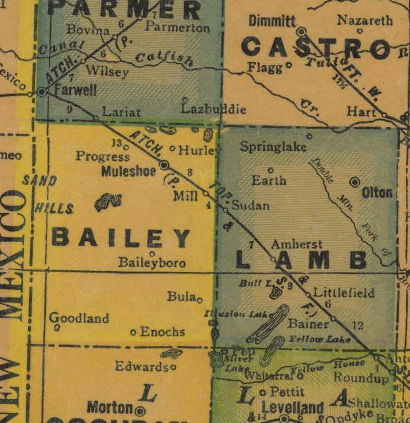 Muleshoe was designated county seat in a special election, April 12, 1919. 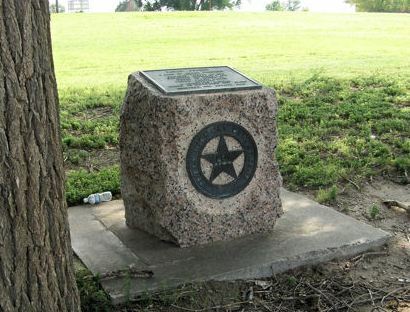 A jail cell was purchased in June 1919 from neighboring Parmer County. In July a building contract was let for first courthouse -- a frame structure soon erected at a cost of $2,450. Since institution of its government, this 832 sq. mi. county, with its good water resources, has developed an outstanding agricultural economy. Its progress is a tribute to the standards of its pioneer settlers. A part of Bexar Territory 1836-1876. Named in honor of Peter James Bailey 1812-1836. A Kentucky lawyer killed in defending the Alamo. 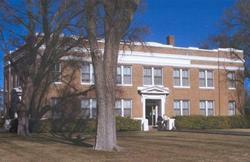 Muleshoe , the County Seat.